These Farm Heroes level 140 cheats and tips will help you beat level 140 of Farm Heroes. 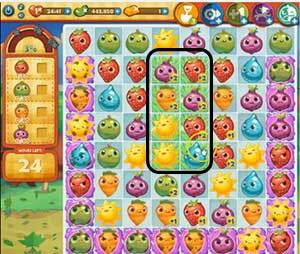 The objective of Farm Heroes level 140 is to achieve 100% growth while collecting 40 apples, 40 carrots, 40 onions, and 70 strawberries in 25 moves. 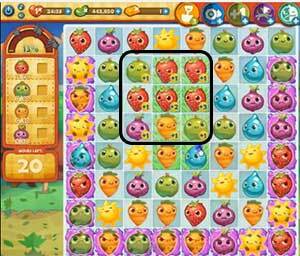 Farm Heroes Saga Level 140has 20 grumpy cropsie squares and only 8 squares of grass. The grumpy squares surround the edges of the board except for the top row. You can’t do much with them so play in the middle of the board. There are 8 grass squares in the middle of the board. You have to make matches in the grass because you get extra points inside the grass and you have a lot of cropsies to collect. You need to collect 190 total cropsies this level, which is a ton. This is why it is necessary to use the +1 booster to increase the value of the cropsies. 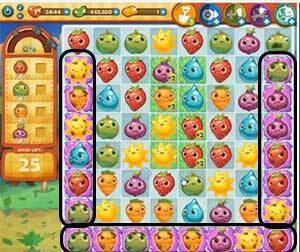 Make a match right next to the apples, carrots, onions, and especially strawberries before you activate the +1 booster. That will help you collect even more cropsies and get closer to the 190 cropsie goal.